In 1986 one of the most unique and powerful tax deductions was created – investments in oil and gas drilling. This allows you to have the opportunity to claw back money destined for Uncle Sam and invest in an oil and gas project that has the potential to pay monthly revenue checks for many years. Here are the top ways you can take advantage of tax breaks for investors. You can legally deduct up to 80% of your investment in the year you make the investment—and up to 100% in just five years. Tangible drilling costs refer to money spent on equipment or other items you can resell (wellheads, tanks, leaseholds, etc.). Tangible drilling costs (TDC) make up about 20% of the drilling costs and are 100% tax deductible. In the example above, the remaining tangible costs ($25,000) may be deducted as depreciation over a seven-year period. (See Section 263 of the tax code.). The IRS also gives a 15% depletion allowance against production revenue to allow for the drop in oil and gas reserves in a well. The 1990 Tax Act allows certain entities to exempt 15% of their gross income from federal taxes to help support smaller oil companies and direct investors. This exemption applies only to companies that produce no more than 50,000 barrels per day of oil or other entities that produce no more than 1,000 barrels of oil per day or 6 million cubic feet per day of gas. With EnergyFunders a unique feature is that you can invest as a general or limited partner. If you invest as a general partner, you can deduct your investment from active income. If you invest as a limited partner, you deduct your investment from passive income. However, general partners have unlimited liability, while limited partners have limited liability. Explore details on becoming a general vs. limited partner and which option fits your goals. Why Are There Tax Breaks for Investors in Oil and Gas? Domestic energy production is a national priority — energy fuels the economy and powers cities, states and governments. 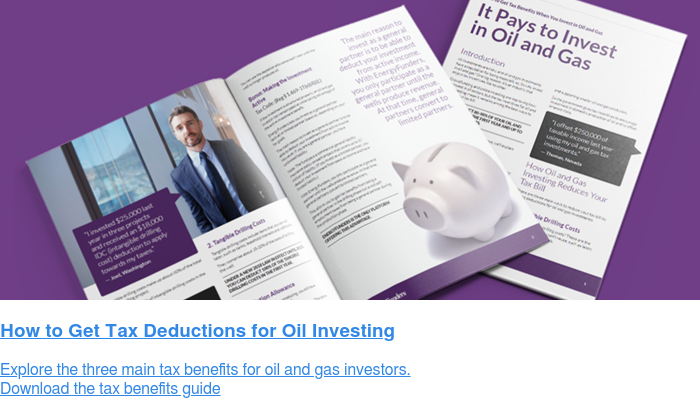 Another reason for these deductions is the inherent risk, and traditionally high buy-ins, involved in oil and gas investing. Tax breaks for investors provide financial benefits for oil and gas investing, regardless of the drilling outcome.